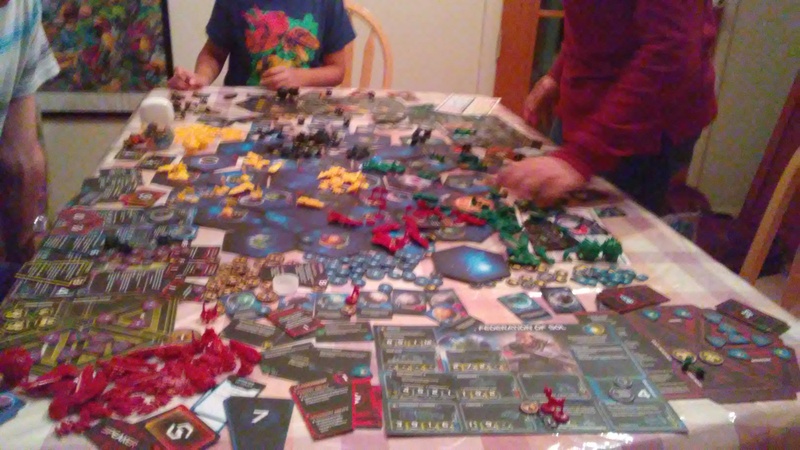 Twilight Imperium Is Awesome, Part 4: For Jord! At last, all of the tile arrangements had been agreed upon. We settled in our randomly determined seats and began playing. To the right of me was Ronald, who had chosen the slippery Ghosts of Creuss. To his right was Torin, the Arborec hivemind. Then came Max, the pesky pirates of Mentak. After that was Ricardo, of the cyborg L1z1x, and Beckett, the sneaky Yssaril Tribes. I, Nate, had chosen the Federation of Sol, the normal, unassuming humans. Ronald (green) – This was my 2nd attempt to play the sneaky tricksters The Yssaril Tribe. The space goblins can “stall” and stay in a round, to take a bunch of unanswered actions at the end of the round. They also are the kings of Action Cards, and can surprise the table with special powers out of their back pocket. Torin (blue) – The undisputed champion of strategy games chose the wormhole-hopping Ghosts of Creuss. 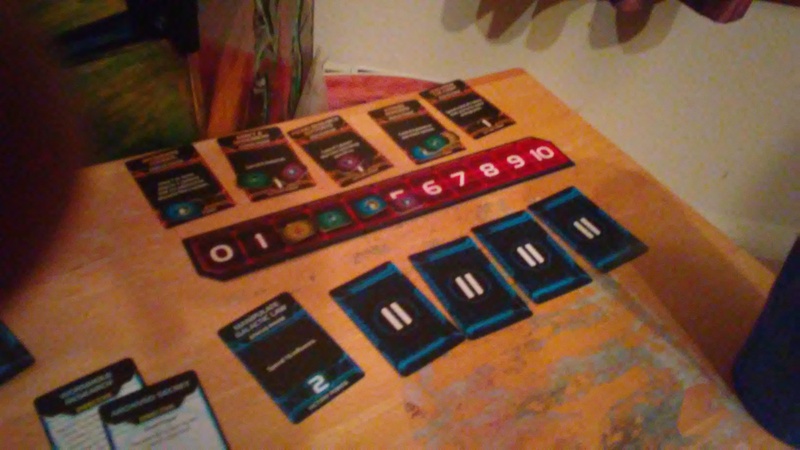 They start in a separate galaxy and have +1 move when starting in a wormhole. Their flagship tugs a Delta wormhole around with it. His sheer mobility was frightening and he could threaten much of the galaxy at once. There were two wormholes near my home system and so I eyed him with suspicion. 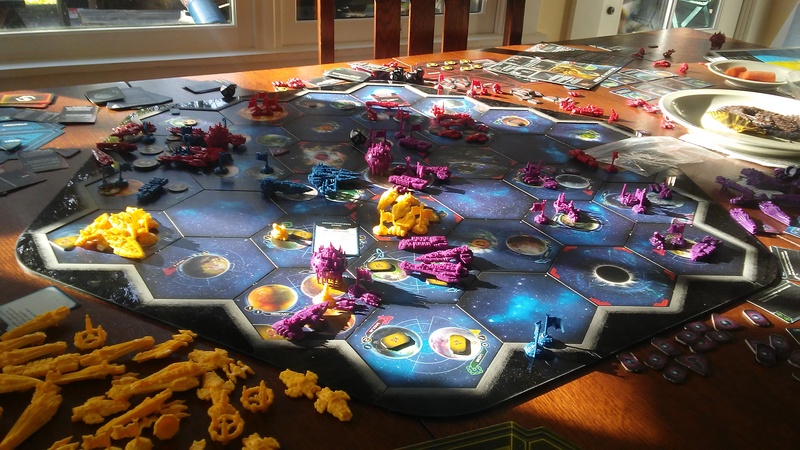 Enzo (black) – For his first game of Twilight Imperium, Enzo chose the solid Xxcha Kingdom, which start with Graviton Laser Systems which allows them to shred capital ships with their space cannons without researching a single tech. Their flagship also came equipped with 3 space cannons and could fire them into adjacent hexes. They can quash agendas and build an uninvadable bulwark o Planetary Defense Systems (PDSs). Nate (yellow) – The Zealot of Defense chose the suicidal Yin Brotherhood, the army of clones who crash into opposing ships and convert ground forces to join their clone cause. Their flagship, when destroyed, destroys all ships in a system. 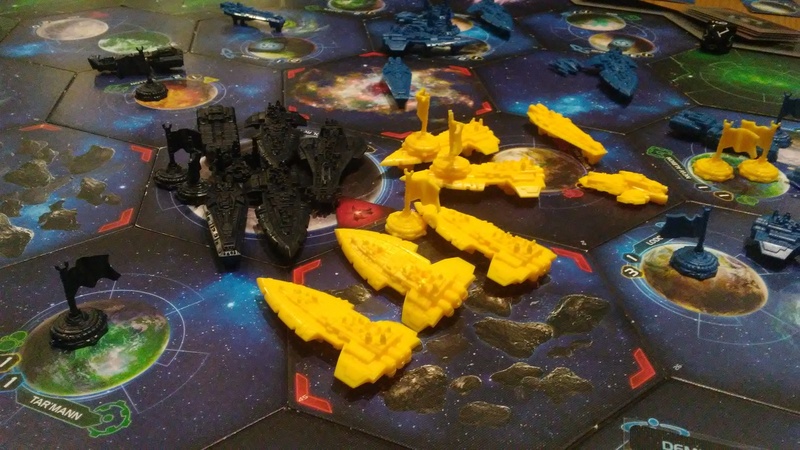 Twilight Imperium – After-Game Report! Ronald, leader of the human Federation of Sol (the Starship Trooper-like humans pictured on the game box) Their greatest strength is that there are so many of them, you can spam ground forces on your planets, bring large armies and fighter fleets around the board, and their infantry are the best in the game. Torin, leader of the Universities of Jol-Nar. (They’re the bug-eyed race with the green space helmets.) Their strength is Science, Science, Science. They get all the starting techs for free, can consistently research 2 techs per round (in a 4-player game at least), and can ignore 1 technology prerequisite when researching a new technology. They always get the science lead and are dangerous in the hands of a player who knows how to leverage it. Their weakness is that they are weak in a fight, with -1 on all combat rolls. Ricardo, leader of the Emirates of Hacan. The space lions that dominate the cover of the game box are the merchants and wheelers and dealers of the game. They consider all factions neighbors from the get-go, they get the most commodities to trade, and they are the only faction who can trade away action cards. They can dominate the political aspect of the game. Nate, leader of the Xxcha Kingdom. The space turtles are able to spread their territory without sending forces, their flagship can shoot 3 space cannons into adjacent systems, and one of their racial techs lets them shut down invasions into their territory. A solid race. I opened the game by predicting Torin’s victory and saying that we all needed to ally against him. We would soon see how this prediction played out. The game started with a period of peaceful expansion, Ronald (Sol) and Ricardo (Hacan) starting with an early friendship being on opposite sides of the galaxy and not in direct competition for resources. The space lions (Hacan) leveraged their merchant abilities and got a wealth of trade goods (11!) at the start of the game. But soon Nate (Xxcha) saw an expansion by the Hacan in their direction as an assault on their living space, and there was an early battle as the space turtles took the planet by force. Meanwhile the Federation of Sol maneuvered into the center of the galaxy and took the center prize of Mecatol Rex and had a lead on territory as well, air-dropping ground reinforcements where necessary. Torin and the space nerds, the Universities of Jol-Nar, sat quietly in their corner of the galaxy and researched their way up the tech tree, soon grabbing technologies that let them send their dreadnoughts throughout the galaxy, even being able to teleport them where needed. The Federation of Sol’s expansionism was soon seen as a threat to all other races, and Ronald in the powerful Speaker position was able to use his considerable influence to swing all votes in the Galactic Council in his favor at the end of Round 3. Ronald held an early lead of 4 points, with all the other factions at 1 or 2, which painted a big target on his back. The Evil Axis of Torin, Ricardo, and Nate openly conspired to take down the peaceful Sol who had obtained so many planets through their hard work and merit. I reminded Ricardo and Nate not to be played by Torin’s political machinations and that he would win the game if they threw their support his way. The scheming Torin of the Jol-Nar openly claimed territories deep in Sol’s territory and during Round 4 advanced his dreadnoughts at the urgings of Ricardo. Nate turtled his way forward and telegraphed a large invasion of Mecatol Rex. Ronald, spread thin throughout the galaxy, reinforced points that were under direct threat, but the suffocating blanket of the Axis of Evil was too much for one faction to fend off. Soon the army of dreadnoughts descended upon Sol’s inner planets, whose spaceships by necessity had to make a hasty retreat to position themselves to reclaim their capital if it was taken. The imperialist Jol-Nar landed on Sol’s planet which had the Propulsion Technology specialty, only adding to Jol-Nar’s monopoly on science. The space nerds then advanced on the Sol capital, Jord, and despite the courageous sacrifice of Sol’s special elite Spec Ops II infantry units, Jord was now under the Jol-Nar flag. However, Sol’s flagship and their own fleet of dreadnoughts stood nearby, ready to counter-attack. It was already 7:15pm — after a rules overview we had started at 1:15pm. After 6 hours, the battles had only just begun moving from local conflicts to an galaxy-wide war. We would have to end on time alone. The biggest battles were yet to come as we closed off for the night, with no one being able to research war suns (aka death stars) before we ended. Round 5 opened with the Sol fleet taking back Jord from the Jol-Nar invaders. The Emirates of Hacan made overtures to the Xxcha to have a nonaggression pact. Nate declined, seeing no use with his huge fleet surrounding Mecatol Rex. Ronald was thinking that Ricardo and Nate were figuring out how to split the Sol pie, when Ricardo turned to his right and attacked a Jol-Nar planet! Torin’s conquering of Sol’s homeworld had made Torin the new leader and shifted global alignments. Ricardo laid waste to the Jol-Nar planet (which he had to do in order to nullify Torin’s troublesome teleporting technology). Meanwhile the people of Sol were assaulted along a second front, as the Xxcha sent in their flagship and main fleet into the Mecatol Rex system, with nearby planets lending their space cannons to the Xxcha flagship’s obscene triple cannons. The Sol’s lone carrier was quickly destroyed, but Mecatol Rex had a considerable ground complement: two Planetary Defense Systems that shielded against Xxcha bombardment and 6 elite ground forces. The space turtles took the planet after taking heavy casualties, and their ground force was reduced from 11 to 2. Torin, meanwhile, had retreated his fleet to around his homeworlds. With surgical efficiency, he sent a fleet to drive out Hacan’s occupying force, and sent his main fleet toward Mecatol Rex! With his fast teched-up dreadnoughts, Torin was able to concentrate a large force from surprise, and his fleet vanquished Xxcha’s army and evicted their weakened ground force. The galaxy shook with the Xxcha’s anger, and a couple of green war suns jumped onto the board — a combined effort of all players was needed to set all the hexes right again. If we had continued, probably only a galaxy-wide alliance to seize Torin’s homeworld could have prevented him from winning. Torin had a technological advantage, but the Jol-Nar’s -1 to combat rolls was going to be a crippling disadvantage in the face of Ricardo’s soon-to-be-deployed war suns. Torin would then have been limited to secret objectives (which the game limits players to scoring 3 points from). If Torin’s homeworld fell, who would have won then? Probably Sol with their many hard-to-conquer planets. But Nate could have brought another flagship-led assault on Sol. And if Ricardo had reached his goal of achieving war suns and fought to win, he might have come up with a heroic come-from-behind victory. But not very likely, as a lot of the scoring objectives don’t require all-out war, and Sol with their homeworld reclaimed could have hopped their way to victory. With Torin crippled, Ricardo and Nate would have had to gang up on Ronald — and then one of them backstab the other for the win. 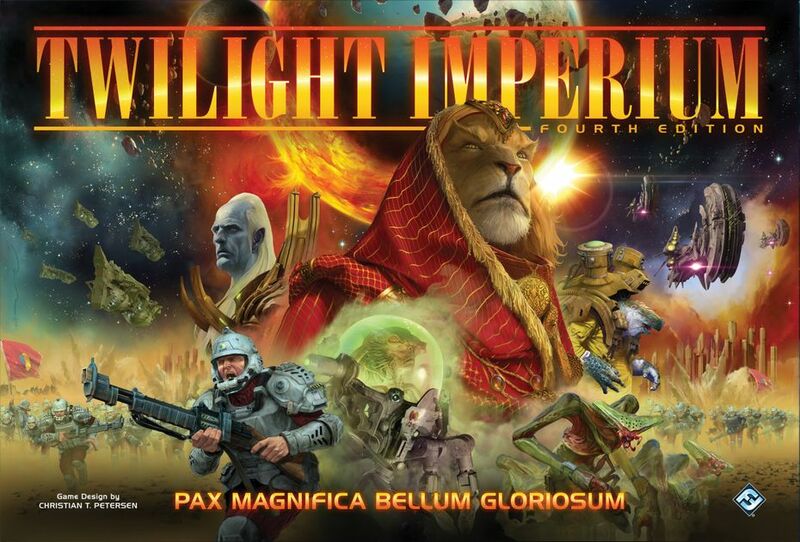 TWILIGHT IMPERIUM was what it promised to be — epic, dramatic, and engaging throughout. It told a story. The game length was a problem, and our group played longer than the average group, as ahemcertainplayersahem deliberated a long time over some of their moves. That’s part of learning the game though. Repeated plays should make make the game go faster. Definitely will play again and set out more than 8 hours for a 4-player game if those same players are there again. And my ultimate dream of a 6-player game would be an all-day affair.